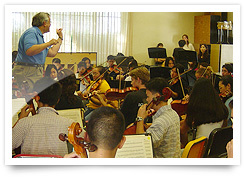 EMIHawaii offers a wide variety of performance opportunities in Hawaii. 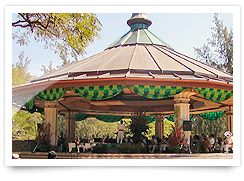 We will work with you to find the perfect fit for your groups' needs. Here your group will have the opportunity to work with University level staff to elevate your group's musical talents with an enriching educational experience. Here, your group will meet school directors and students from Hawaii. Students will then perform for each other and break off into cooperative groups to compare/contrast music at both schools while sharing experiences and learning from each other. 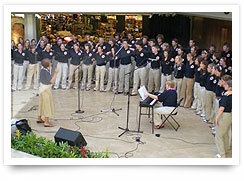 Your group will learn a few Hawaiian Songs prior to your visit to Hawaii. You will then head down to the beach with the Happy Hawaiian to learn the history and culture of the hula motions that tell the story of the songs. This performance is a way to experience Hawaii's rich musical history by attending a joint performance with the Royal Hawaiian Band. 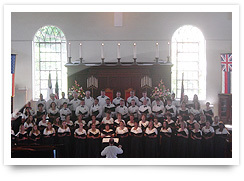 The band was founded by King Kamehameha III and is one of the last links to the Hawaiian Monarchy. Hula in Polynesia is to tell a story. Prior to the early 1800's there was no written language and stories were told in this Ancient Dance. Today your group will learn the art of hula and spend some time with two of Hawaii's most popular entertainers.